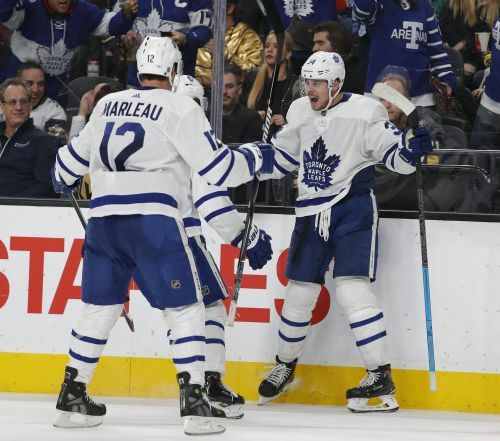 LAS VEGAS (AP) — Toronto Maple Leafs center Auston Matthews registered his 100th career NHL point in Las Vegas. NOTES: Vegas defenseman Deryk Engelland played in his 600th career game. ... The Golden Knights have allowed only 11 goals in 80 times short-handed during the 28 games played at T-Mobile Arena this season. ... Johnsson left the game in the second period, and did not return, after being kneed in the left leg by Vegas defenseman Brayden McNabb. ... Marner has at least one point in 11 of the last 15 games. Toronto: Visits Arizona on Saturday. Vegas: Hosts Nashville on Saturday.